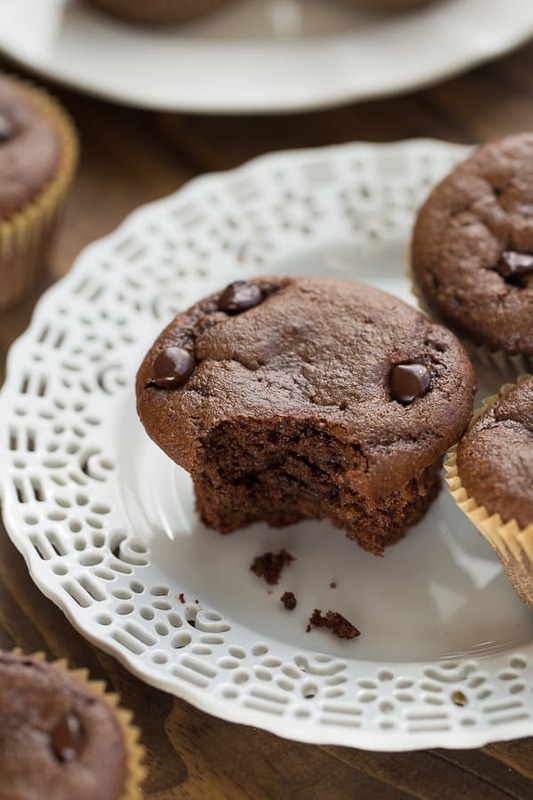 These Chocolate Almond Butter Muffins have fulfilled all my healthy muffin dreams. They are light, moist and full of healthy ingredients. 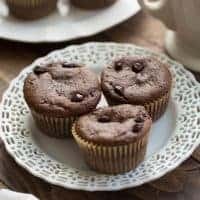 These might look like your average chocolate muffin, but trust me when I say these are anything but ordinary! I love, love easy healthy muffins recipes but was seriously lacking a good chocolate muffin recipe. These Chocolate Almond Butter Muffins have fulfilled all my healthy muffin dreams. They are light, moist and full of healthy fats and protein. I don’t feel bad one bit giving my kids one of these for breakfast chocolate and all! 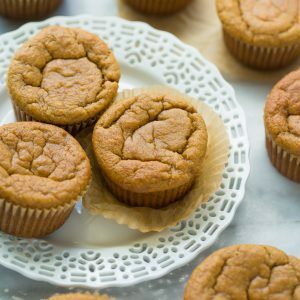 I had a hard time deciding what to call these muffins because they are grain-free, refined-sugar-free, dairy-free and paleo. That would make a pretty long title so healthy chocolate muffins it is! I like to keep my freezer well stocked with things like homemade waffles and healthy muffins for easy snacks and breakfasts. I also love these muffins because they are so easy to make! They are made with easy-to-find ingredients and only take 1 bowl and 30 minutes to make.I am definitely one to get the occasional (or frequent!) 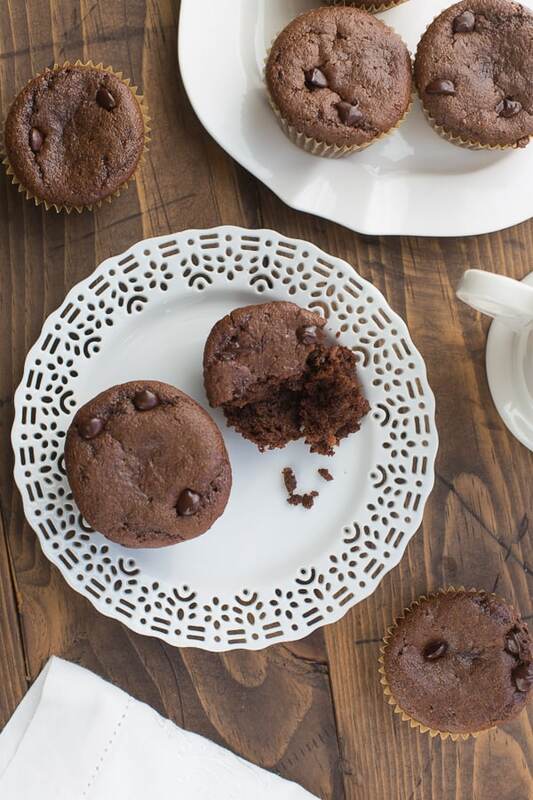 chocolate cravings and these muffins totally hit the spot. I hope you love them as much as we do! Preheat the oven to 350F. Line a cupcake pan with paper liners. Place all the ingredients (except the chocolate chips) in a large glass bowl. Using a hand mixer, mix to combine until the batter is totally smooth. Add the chocolate chips and mix until incorporated. Divide the batter evenly between in the cupcake pan. Bake for 20-25 minutes until cooked through and a toothpick inserted into the center comes out clean. Let cool for 5 minutes then transfer to a wire rack to cool completely. Enjoy! Is there cocoa powder in these? It looks like there is from the photo, but it’s not listed as an ingredient. Sorry about that! I just fixed the recipe. I was also supposed to be 1/2 teaspoon baking soda. Thanks for letting me know! You have a 1/2 t of baking- is that soda or powder? Thanks! Hi Cassie! I haven’t tried anything but the coconut sugar in this recipe so I don’t know of a substitute. It might throw off the liquid ratio to use all maple syrup or honey. I need receipes that don’t have oats,coconutflour ect,just almond or nut flours in it. I have A blood and it’s hard to find receipes with out many flours. Idon’t like to use sugar I use homemade applesauce from sugar. Can you help? Hi Erin! What maple syrup do you use? I use the maple syrup from Costco! Made these tonight with my kids – super yummy, thanks so much for the recipe! I’m so glad you liked them! Thanks for commenting! Tried these today and they taste really good. I used enjoy life chips to make them completely dairy free. It took a little longer to cook than 25 minutes but turned out great! I’m glad they turned out for you! Enjoy Life chips are my favorite too! Hi! What are the nutritional facts on these per serving? If I have almond meal instead of almond butter, think that could work as a substitute? Hi Laura! Unfortunately I don’t think that will work here. Almond butter is needed to keep everything moist and hold it together. Sorry about that! Just put your almond meal in the food processor for a couple of minutes and you will have almond butter! Yum! Can I use an 8 X 8 pan instead of making them into muffins? Hi there! How do you store them (fridge or counter?) and how long will they last? Thank you! Has anyone tried less sugar? Thats,quite a bit for a few muffins. maybe 1/4 c coconut sugar and then maple syrup? I completely forgot to add the coconut sugar and they were still delicious. I find with many cake recipes if you reduce the sugar by a third they are still fine! Do you know the carb count on these muffins? 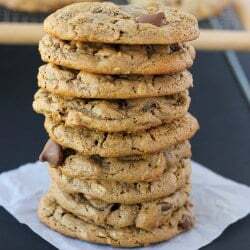 How many chocolate chips did you use? Una pregunta Erin, es baking powder o baking soda?? I love to bake and I love to eat sweets, but I’m trying to find healthier sweets. I made these and used half peanut butter and half almond butter. I left the chocolate chips out because the batter seemed sweet enough already. These are amazing and very moist. I gave one to my friend and she said they reminded her more a cupcake than a muffin. She said the nut butter flavors weren’t very obvious, but the chocolate was. She got me thinking about these as a cupcake, so the next time I make them, I’m going to add a peanut butter frosting that is made with Greek yogurt, low fat cream cheese and maple syrup. I made these but tweaked it a bit to my liking and they are now only 193 calories each! Thanks for sharing this superb recipe. Can you share how you tweaked!! can you use peanut butter instead of almond butter? Hi Erin, Greetings from sunny Singapore. I made these Almond Butter Chocolate Muffins and they turned out beautifully. However, I used peanut butter as I didn’t have any almond butter at home. I find it a bit sweet,perhaps I had used slightly sweetened peanut butter, so I will try another batch without coconut sugar and see if this works. Thank you for sharing this wonderful recipe. Do you know if this recipe will still work with flax eggs instead of regular eggs? I want to say no because you need the eggs for the structure of the muffin. Sorry about that! can i substitute peanut butter? for almond butter? Thank you so much for this recipe. Our family has only recently had to make the gluten free, dairy free lifestyle change, and finding delicious, make-ahead treats that my children will eat has been difficult. This though has been a wonderful find for us. 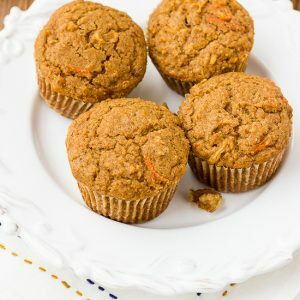 I also wanted to mention that since we all loved these so much, I also tried a version that is a cross between this recipe and your toddler carrot/zucchini muffins. I used the almond butter, apple sauce, maple syrup and 2 eggs from this recipe and combined them with the carrots (didn’t have any zucchini on hand) and cinnamon from that recipe, and it gave a great result. I ended up with a better texture than when I tried the original toddler zucchini/carrot muffins with almond flour (For the diet we are following, I have to make my own flour, and that has not worked so well). Anyway, thanks again! These are heavenly. I love this chocolate treat in the morning and evening. 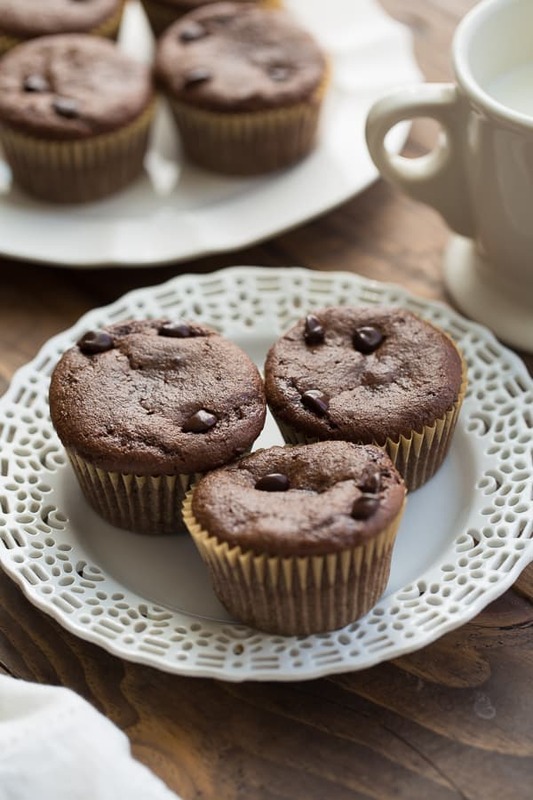 these were sooo good–I just made them–My Hub and I think they taste just like any chocolate muffin you would buy in a bakery or store only much better and healthier!! moist and chocolatey—thanks for the recipe it is a keeper in our house!